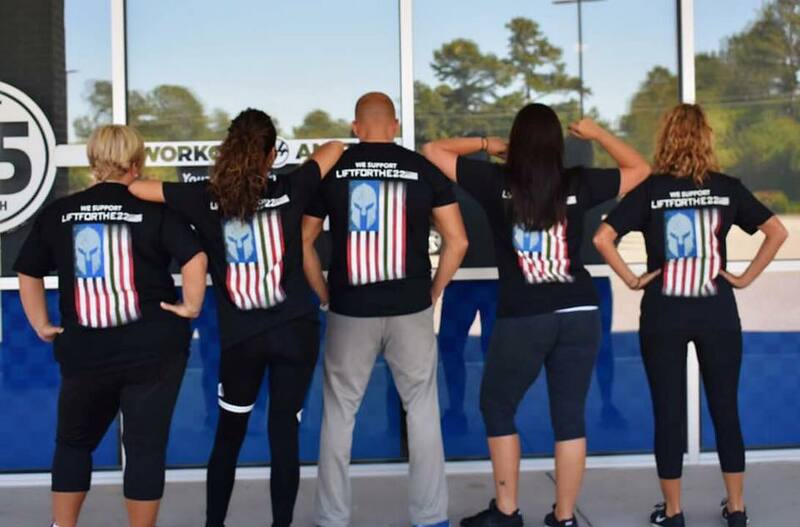 Workout Anytime Sumter (in Palmetto Plaza) will participate for the third time in the Lift for the 22 organization’s national fundraiser to offer free or affordable gym memberships for military veterans. Lift for the 22, a program designed to help veterans reentering civilian life, was founded by Carter Davis shortly after his return from active duty in 2013. The name of the program came from a 2012 suicide data report from the Veterans Administration, which stated the suicide rate of veterans as 22 a day. A more recent study has corrected that figure to about one a day. Davis himself suffered from severe depression and loss of identity upon his separation from the military, which led to a divorce that he said nearly led him to become a suicide statistic. Friends who worked out regularly suggested Davis come to their gym, where he found support and comfort. The benefits of fitness and peer support helped him make the transition to civilian life and influenced him to found Lift for the 22 to help other veterans. The program provides free or reduced rate one-year gym memberships to 22 veterans in communities in the U.S. Ashley Strickland, manager of Sumter’s Workout Anytime, said the local gym is holding several fundraisers to offset the costs of Lift for the 22. Anyone purchasing a T-shirt will also get passes for workouts. Strickland said Davis, through the national Lift for the 22 organization, will provide the 22 one-year memberships to veterans across the country. In addition to providing the memberships for veterans, Lift for the 22 also puts veterans in a program to help them achieve and maintain a healthy lifestyle through fitness, nutrition and supportive relationships. Veterans are assisted through regular workouts and life, emotional, fitness and readiness coaching, with regular progress checks to help them achieve their personal goals. Workout Anytime is located at 493 N. Guignard Drive in Palmetto Plaza. Call (803) 773-0101for membership information. For more about Lift for the 22, visit the nonprofit organization’s website, www.liftforthe22.org or visit the Lift for the 22 Facebook page.